The ever changing distribution landscape, customer’s expectation of personalized experience, environment friendly stay and need for actionable insights are becoming more important than ever. 20% of hotel queries are from mobile, thereby posing a challenge for hoteliers to create the next generation mobile friendly pre to post stay engagements. Travelers are engaging in social media like never before. It is becoming a challenge for hoteliers to manage their brand reputation, understand customer sentiments and resolve issues proactively. With the KPIs – Occupancy, ADR and RevPAR on the rise, the hospitality industry is showing a sign of recovery from economic recession. 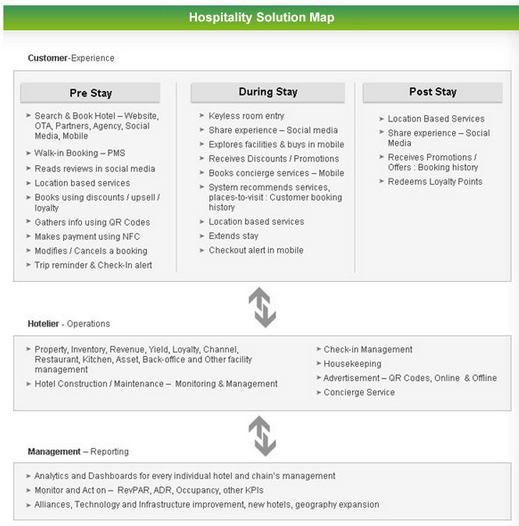 This is an incredibly opportune time for hoteliers to create disproportionate business value, expand geographically and deliver a memorable experience to the end customer by relying on actionable analytics, rich dynamic content, robust backend operational systems and social media engagements. Create and manage robust mobile friendly website / native app to – assist customers in their bookings, take advantage of location based services, mobile notifications, NFC, augmented reality, hardware specific features and report analytics for management. Integrate, test, deploy and manage all operational software – PMS, Restaurant & Bar POS, Kitchen console and Asset, Inventory, Housekeeping, Distribution Channel, Concierge and other facilities management systems.